It's January and that means a brand new year for reading! If you read my 2016 resolutions post then you'll know that I've set myself the challenge of reading 85 books this year, so I thought I'd get a jump on my reading and join in with a couple of January readathons. Both TBR Takedown and Bout of Books take place this coming week; from January 4th through January 10th so I'll be doing both at the same time. Bout of Books is a relaxed readathon with no TBR challenges and the goal is to just read as much as you can and have fun doing it. There's going to be all sorts of daily challenges and giveaways throughout the week so it's best to keep up with everything using #boutofbooks on Twitter. 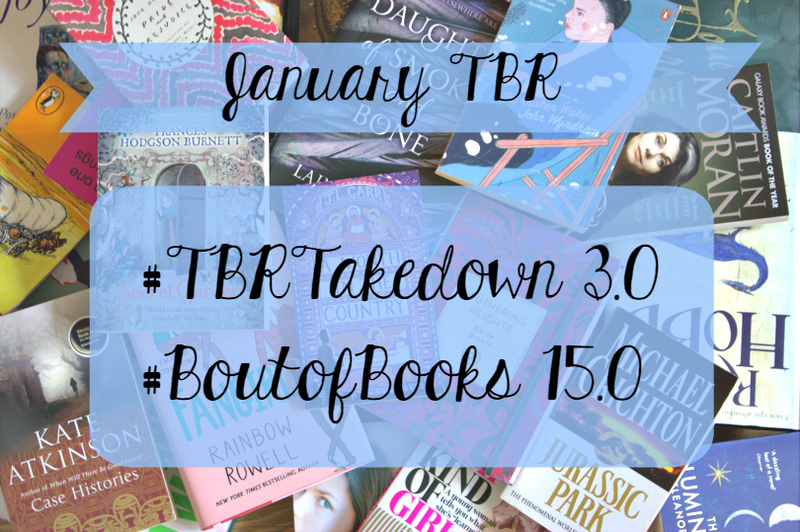 TBR Takedown is hosted by Shannon from leaninglights (check out her readathon announcement video here) but various people will be hosting sprints, challenges and giveaways over on Twitter so make sure check out #TBRTakedown for updates. There are seven TBR challenges for this readathon but there's absolutely no pressure to stick to these, it's all about just having fun. I'm going to try and complete as many of the challenges as I can just so I can tick a few books off my TBR and I'm going to be incorporating a couple of challenges into some of the books because I think seven books in a week is way too ambitious for me! - Read a book from your most recent book haul. 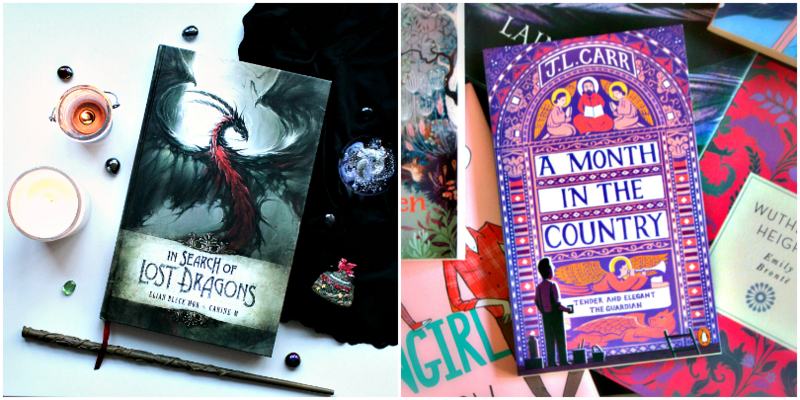 I was lucky enough to get the beautiful In Search of Lost Dragons by Elian Black'Mor and Carine-M for Christmas and I'm beyond excited to read it. It's a fully illustrated story of an intrepid illustrator and reporter who travels across Europe and through the Middle East in search of dragons. It's kind of journal-style with snippets of newspapers, notes, local folklore and it's absolutely packed full of beautiful fully-painted illustrations. I'm going to be featuring this book a lot on my Instagram so head over there to see inside. I got A Month in the Country by J.L. Carr for my birthday in 2014 and haven't got around to picking it up yet so now's the time. I really don't know much about this at all except that it has a beautiful cover and was nominated for the Booker prize in 1980. It's also relatively short which is great for readathon-ing! - Read a book outside your comfort zone + read a non-novel item. For these two challenges I'm going to be reading On the Beach at Night Alone by Walt Whitman. This is from Penguin Little Black Classics range and is a selection of verses from Whitman's Leaves of Grass. I've tried to read Leaves of Grass before and found it quite challenging and just didn't manage to get through it. I'm hoping this little selection will open me up to Whitman a little bit more. - Read a first book in a series. The series I'm hopefully going to be starting this week is the Lunar Chronicles series by Marissa Meyer, beginning with Cinder. This series has had so much hype and the first book has been sitting on my shelf for months but for some reason I haven't started it yet. Hopefully I'll love it! - Read a sequel in a series. This is kind of cheating because it's the book I'm already reading but this week I'm going to be continuing on with The Assassin's Blade by Sarah J. Maas, which is the selection of Throne of Glass novellas. I've decided to read this series in the order of publication and this came out before Heir of Fire, so I'm treating it as a sequel. So those are the books I'm planning to read for the #Boutofbooks and #TBRTakedown readathons. I'll be posting frequent updates on Twitter and Instagram, so make sure you're following me on there to keep up and let me know if you're readathon-ing too! Will you be taking part in either of these readathons? Let me know!